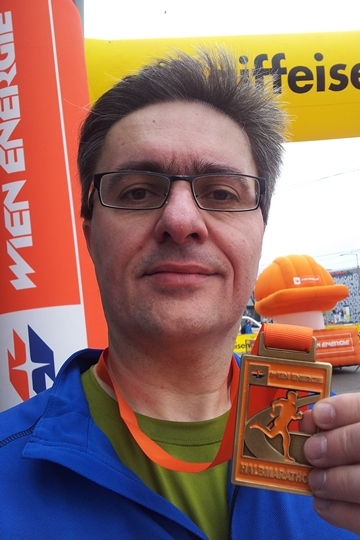 Today I finished my first race ever, the Wien Energie half marathon 2015, in 2:06:26. Weather conditions were fine, with 7°C, modest winds and no rain, and I had a nice run at almost constant speed throughout the race. I even ran right next to the unbeatable Lemawork Ketema, if only for a split second, as he was passing the field to start his third round. Thanks to the organizers, support staff, cheerleaders, drummers and spectators for making this a great event! Now that I have completed the half marathon distance, I have even more respect for the challenge ahead of me. Next month I will #Run4CARE at the Vienna City Marathon and raise funds for charity. CARE is a leading humanitarian organization fighting global poverty, providing disaster relief and supporting sustainable development projects. Please help my quest and support the “Packages for Children in Need” campaign. Thank you kindly!